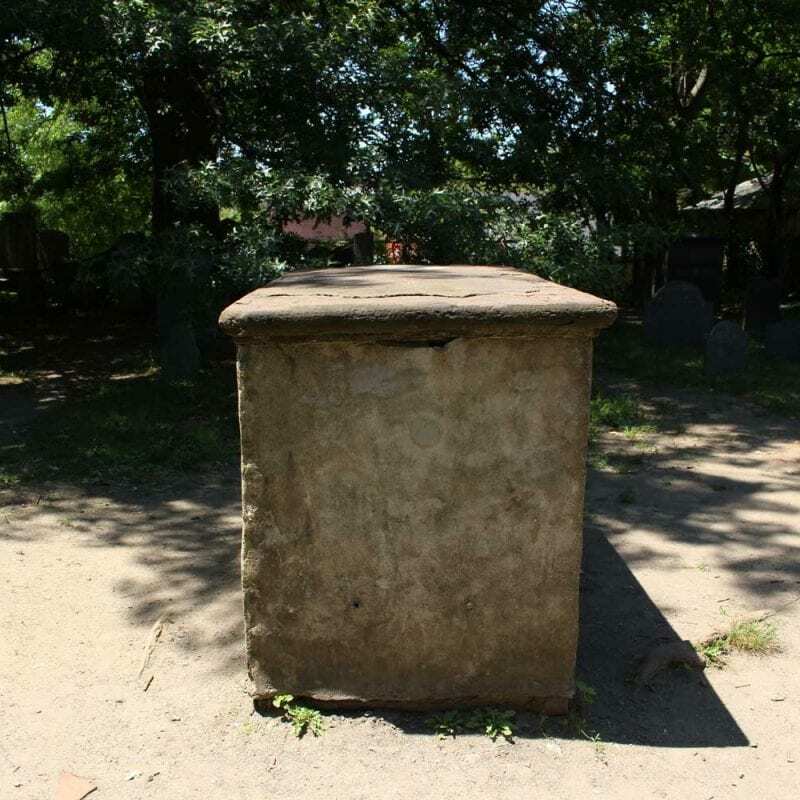 In the center of the cemetery, approximately 60 feet from the front gate, is a red sandstone tabletop tomb which holds the remains of Bartholomew Gedney, another judge from the witchcraft trials. A Salem native and physician by profession, Gedney was the third Salem Town magistrate, and was often in the company of Hathorne and Corwin. He was a land speculator, a sawmill owner, a shipyard owner, and a major in the militia. His entrepreneurial spirit may have come from his father, who owned the successful Ship Tavern on present-day Essex Street. After his father’s death, Gedney jointly inherited the tavern with his sister-in-law Susanna. The tavern came to be known as “Widow Gedney’s.” Both widow Gedney and Bartholomew’s other sister-in-law Mary Gedney, would sell refreshments to participants of the witch trials. Gedney was present at the examination of his friend John Alden on May 31 in Salem Village. When Gedney witnessed the torments of the afflicted girls, he told Alden he had “always look’d upon him to be an honest Man, but now he did see cause to alter his judgement.” Gedney died in 1697 and was interred here in the Gedney family tomb. Toward the back of the cemetery, on the left side, is a small gravestone marking the grave of Mary Corey (alternate spelling Corry). Mary, the second wife of Giles Corey, died eight years before the witchcraft trials. Corey’s first wife died in England before he arrived in Massachusetts. His third wife Martha was hanged for witchcraft on September 22, three days after Giles was pressed to death in a Salem field. Eleanor Hollingworth is also buried here, in a grave on the far left next to the fence. Eleanor (alternate spelling Elianor, as on the stone) was the mother of Mary English, the wife of one of Salem’s richest merchants, Philip English. Both Philip and Mary were accused of witchcraft, examined, and jailed in Boston to await trial. The Phillips’s great wealth meant they could escape to New York, only returning to Salem when the turmoil died down. Eleanor was an independent woman, who ran the Blue Anchor Tavern on Salem’s shore road after the death of her husband. According to historian Frances Hill, Eleanor Hollingworth may even have been the model for Nathaniel Hawthorne’s Hester Prynne in The Scarlet Letter. Also buried here, and noted on the stone, is Eleanor’s son and Mary English’s brother, William. A short distance behind the bronze “map” in the front of the cemetery are the graves of two Samuel Shattucks (alternate spelling Shattock). The first grave marks the resting place of a Samuel Shattuck who passed away in 1681. He is buried along with his grandson, Samuel Shattuck Jr. Samuel Shattuck Jr.’s father was also named Samuel Shattuck, and he was one of the individuals who gave testimony against Bridget Bishop. Accuser Samuel Shattuck was a dyer, shopkeeper, and a Quaker. He believed Bishop was creating a witch’s doll, or poppet, when she brought him small pieces of lace to dye. When their eldest son, Samuel Shattuck Jr. became ill and suffered physical and mental agonies, Shattuck and his wife blamed these maladies on visits from Bridget Bishop that began when the boy was four. Shattuck testified to this effect at Bishop’s trial, and ultimately Bridget Bishop was the first to be executed as a witch in 1692. 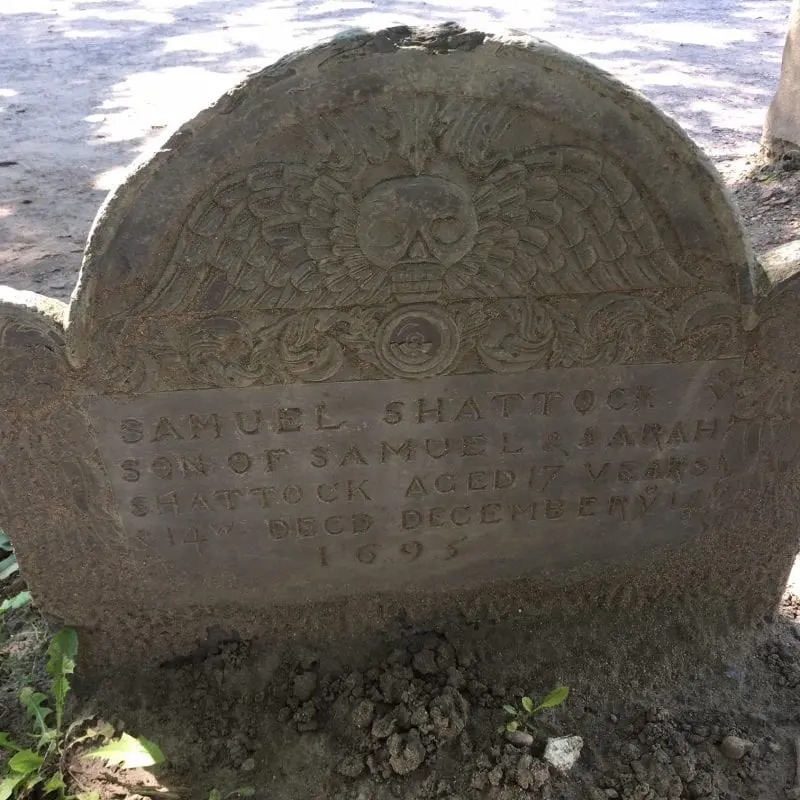 Samuel Shattuck Jr. died in 1695 at the age of 17, and is buried in the Charter Street cemetery next to his grandfather. 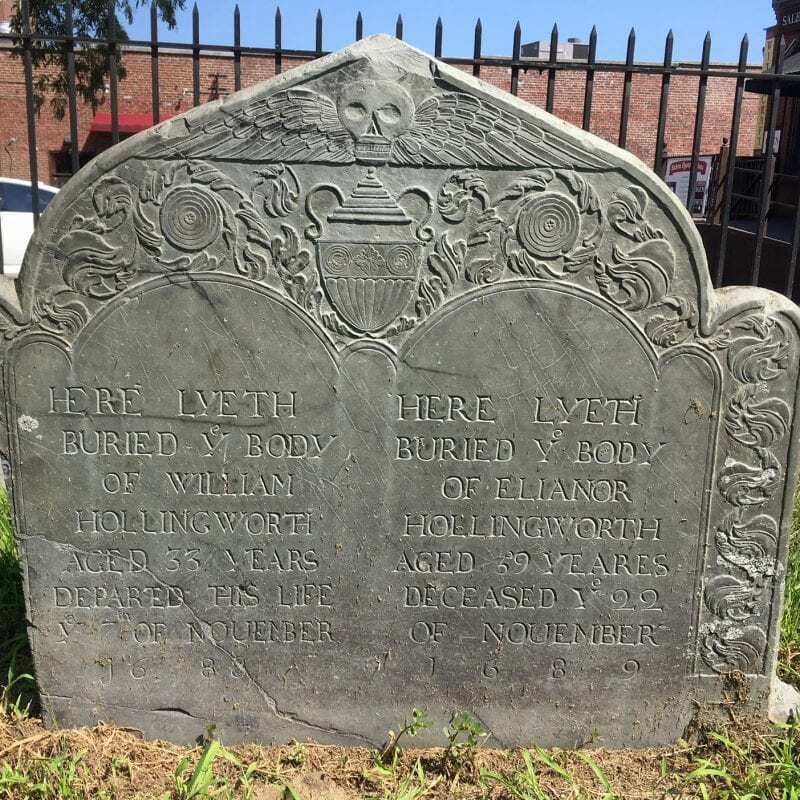 It is believed that Reverend Nicholas Noyes is buried in the Old Burying Point, although his grave is unmarked. Noyes, who never married, died in 1718 just before his 70th birthday. The last governor of Massachusetts Bay Colony under its original charter was Simon Bradstreet, one of the original founders of the Puritan community. Born in Lincolnshire, England in 1603, he arrived in 1630 on the Winthrop Fleet and was involved in Massachusetts politics for much of his life. He was the 20th (from 1679-1686) and 21st (from 1689-1692) Governor of the Massachusetts Bay Colony, succeeded by William Phips in May of 1692. Phips became the Governor of the Province of Massachusetts Bay under the new charter. Phips offered Bradstreet a position in his government, which Bradstreet declined. Bradstreet was a moderate politician throughout his career, and an outspoken critic of the witchcraft trials. He was married to America’s first published poet, Anne Bradstreet. She was the daughter of Massachusetts co-founder Thomas Dudley. Simon Bradstreet died in Salem at the age of 94 in 1697 and was buried in the Old Burying Point Cemetery in this impressive tomb, on the right side of the cemetery. 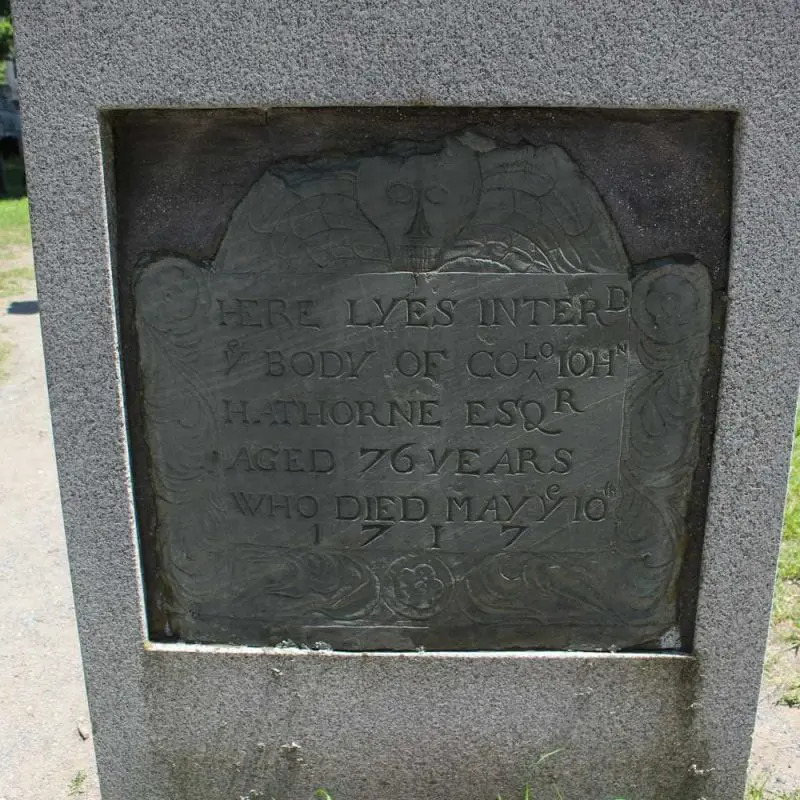 In the 1790s, the Bradstreet family sold the tomb to the Hathorne-Ingersoll family, who, it is thought, discarded the remains to make way for new burials. In 1917, a memorial plaque was placed on this cenotaph (an empty tomb that pays tribute to a person whose remains are elsewhere), acknowledging its former occupant. The second wife of Salem’s Reverend John Higginson is buried here, next to the Bradstreet tomb. Mary Higginson married the reverend in 1677, after the death of his first wife Sarah. Although Higginson was the senior minister in Salem at the time of the witchcraft trials, it was his assistant Nicholas Noyes who took the lead in the proceedings. Mary died in 1708 at the age of 73. Reverend Higginson, whose ministry lasted an amazing 48 years, from 1660 to his death, also in 1708, was 92 when he died. The Old Burying Point Cemetery is on Charter Street, behind the Peabody Essex Museum, and next to the Witch Trials Memorial. The tomb of witchcraft trials judge Bartholomew Gedney. 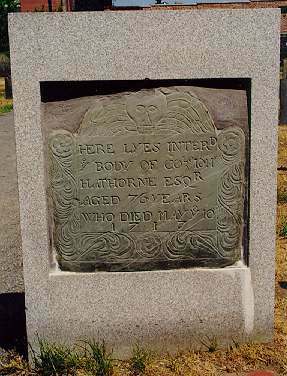 The grave of witchcraft trials judge, John Hathorne. The grave of Eleanor and William Hollingworth, mother and brother of Mary English, who was accused of witchcraft along with her husband Philip English. The grave of Mary Higginson, second wife of Reverend John Higginson. 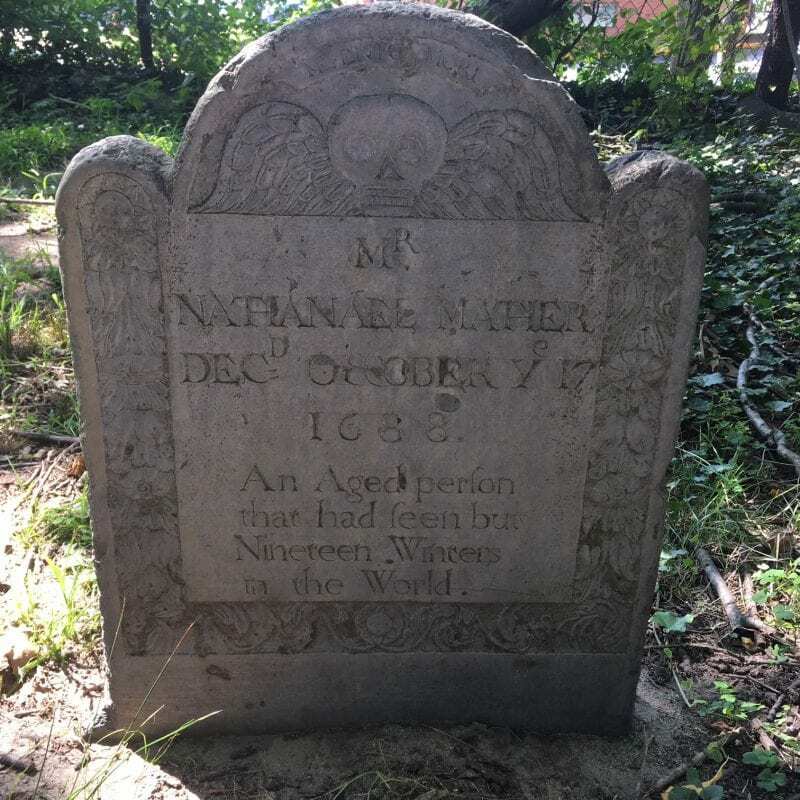 The grave of Nathaniel Mather, brother of Cotton and son of Increase Mather. The stone is by noted Quaker carver William Mumford. The grave of Samuel Shattuck. Bridget Bishop was accused of bewitching him and causing his declining health. A cenotaph. The remains of Simon Bradstreet, the last governor of the Massachusetts Bay Colony, were once here. The remains were "discarded" once the tomb was sold to the Ingersoll-Hathorne family in the late 1700s.